†Steward will take the player's full gold amount at the time of purchase, within the minimum and maximum price range. †Child's Bedroom only available if Hearthfire is installed. Choosing this upgrade will replace the Alchemy Laboratory. ‡Child's Bedroom only available if Hearthfire is installed. Choosing this upgrade will replace the enchanting laboratory. You can switch back and forth between the Enchanting Laboratory and Children's Bedroom at will. †The Child's Bedroom is only available if Hearthfire is installed. Choosing this upgrade will replace the Alchemy Lab and is repeatably reversible. In its most basic state, Hjerim features little more than a wardrobe, bed, and a chest. 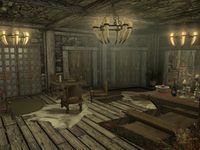 However the upgrades available for Hjerim make it arguably one of the most desirable houses in the game, featuring the largest amount of storage space, a large armory with several display cases, plaques and mannequins, and a large amount of bookshelf space. 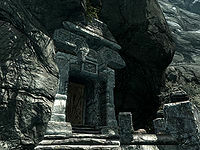 Hjerim also features a secret chamber, which can be turned into an Alchemy and Enchanting room. You must complete Blood on the Ice before you can decorate Hjerim. †8,000 gold minimum to purchase. However the steward will take your full gold amount at the time of purchase, up to 12,000. ‡Bones and blood stains will remain, regardless of upgrades, until this is purchased. Purchasing the living room upgrade beforehand will remove this option for purchase (see Hjerim bugs). ††Child's Bedroom only available if Hearthfire is installed. Choosing this upgrade will create a new room in the hall outside of the hidden enchanting/alchemy room, making the entrance to the hidden room inside the children's room. †Child's Bedroom only available if Hearthfire is installed. Choosing this upgrade will create a new room next to the master bedroom. Myrwatch is added by the Myrwatch Creation. 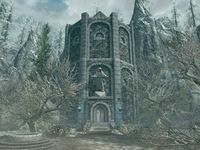 It is an abandoned wizard's tower found out in the marsh east of Morthal. It can be earned by completing the related quest and comes fully furnished. 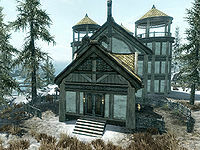 The tower has two levels, with extensive storage space as well as many crafting stations: a smelting pot, grindstone, tanning rack, workbench, alchemy lab, arcane enchanter, cooking pot, staff enchanter, and a unique anvil known as the All Forge which can be used to craft items that are usually only only craftable elsewhere. Your spouse and adopted children can also be moved into the property. Shadowfoot Sanctum is added by the Shadowfoot Sanctum Creation. 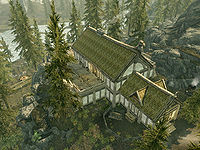 It is a small underground player home found in the Ratway beneath Riften. It can be purchased from Vekel the Man for 7,500 gold. 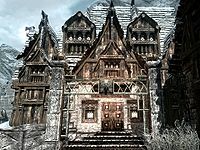 It comes fully furnished and has extensive storage facilities, shrines to several Divines, as well as many different crafting stations: a smelter, anvil, grindstone, tanning rack, workbench, alchemy lab, arcane enchanter, cooking pot, and oven. Your spouse and adopted children can also be moved into the property. 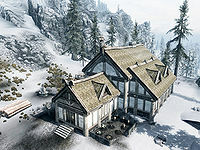 Tundra Homestead is added by the Tundra Homestead Creation. 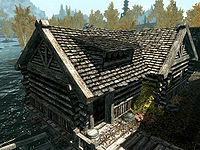 It is a small cottage found just east of Whiterun and can be purchased from the city steward for 7,500 gold. 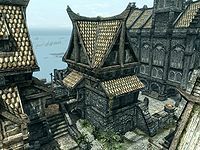 It comes fully furnished and has extensive storage facilities in the basement, shrines to several Divines, as well as many different crafting stations: a smelter, anvil, grindstone, tanning rack, workbench, alchemy lab, arcane enchanter, cooking pot, and a baking surface. Your spouse and adopted children can also be moved into the property. 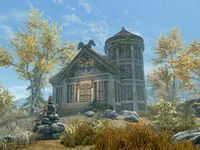 Drelas' Cottage is a house with both an alchemy station and an arcane enchanter as soon as the hostile owner Drelas himself is dealt with. However the location is far from most other facilities. Mannequins may come to life, animating like an idle NPC. Armor removed from a mannequin may end up duplicated back onto it. See Glitches. 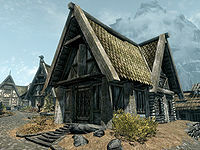 With Hearthfire installed, interior house zones (in particular, the child's bedroom) may have large gaps between textures, and entering these gaps may cause you to fall outside the playable area and respawn in a random house wing. This page was last modified on 26 March 2019, at 18:54.